Adds a hot spring along the road side by Stonehills mining camp. 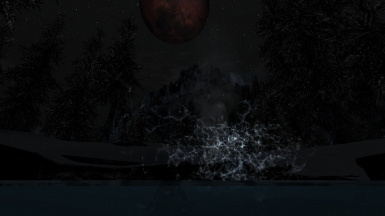 I always felt that Skyrim should have had more than one location for hot springs, there is obviously a history of Volcanic activity throughout the landscape. I came across this spot along the road with depressions of dry ponds already there in the landscape and felt that they practically screamed of a Hot Spring ;) Enjoy! 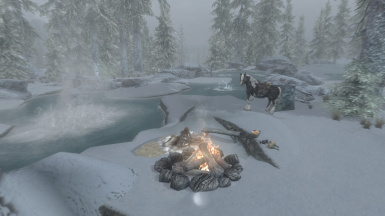 This mod adds a series of ponds and hot springs along the road right across the road from Stonehill mining camp and has been tested to work in Skyrim Special Edition! 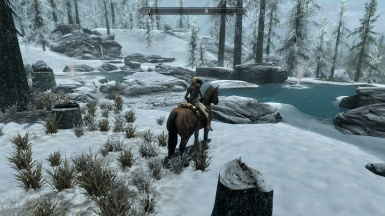 The springs will actually warm you if you use Frostfall. 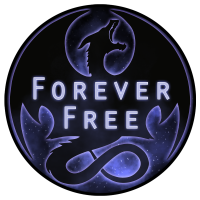 This mod is pretty simple and undemanding, but I know of at least two mods that will most likely conflict with it as both add a roadside Tavern to that approximate location. They are "Expanded Towns and Cities" by missjennabee and "Inns and Taverns" by menathradiel. How much they conflict I cannot say as I no longer use either mod, either one may actually work with the hot spring just give it a try if you want to use either. Installation: Simply use the NMM tab to install via mod manager, or for manual install drop contents of the zip folder into your Data folder and when asked to override a file say yes to all.